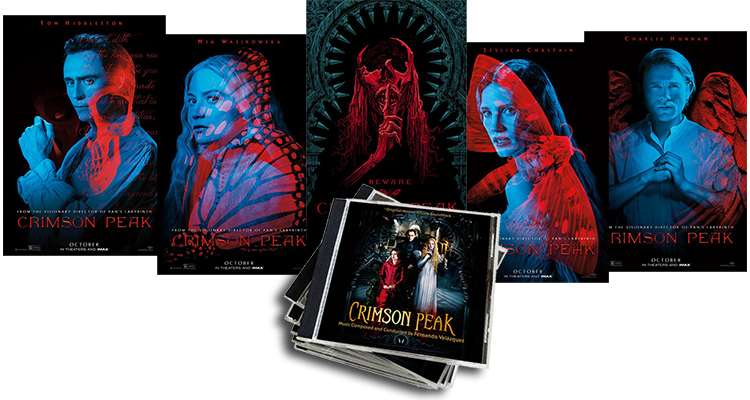 Quartet Records and Legendary Pictures are proud to present the stunning, haunting score composed by Fernando Velázquez (The Orphanage, The Impossible, Mama, Hercules) for Guillermo del Toro’s new, visually fascinating gothic tale, Crimson Peak, starring Mia Wasikowska, Jessica Chastain and Tom Hiddleston. In this gothic romance, set at the turn of the 20th century, a mysterious stranger named Sir Thomas Sharpe woos young author Edith Cushing and brings her as his bride to his mansion atop a clay mountain in Cumbria, England. There, Edith meets Sharpe's strange and secretive sister, Lucille, and learns that her new home holds many disturbing secrets that will force her to fight for her sanity and her very life. Performed by The London Philharmonia under the baton of the composer.